DEAR MAYO CLINIC: After undergoing gastric bypass surgery last year, having a glass of wine affects me much more than it used to. Is this typical? ANSWER: Yes. In fact, the effects of alcohol are nearly doubled in people who have had gastric bypass surgery, compared with those who haven’t had the procedure. 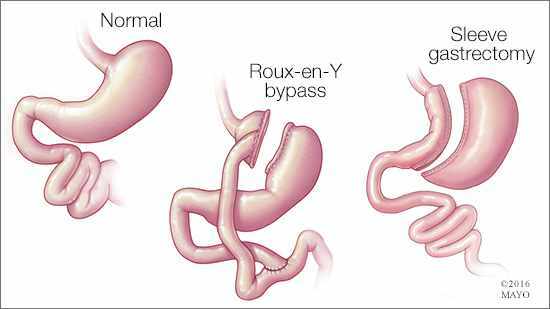 Gastric bypass — one of the most common types of bariatric surgery in the U.S. — helps you reduce your food intake by creating a small gastric pouch. Before the surgery, food enters your stomach and passes into the small intestine. After surgery, most of the stomach and the first part of your small intestine (duodenum) are bypassed, and a digestive route directs food into the middle section of your small intestine (jejunum). This helps you lose weight by limiting the amount of calories you can consume and absorb. But, this direct route to your small intestine also allows your body to absorb alcohol more readily — and much faster. Your gastric pouch is unable to break down alcohol as effectively as your old stomach would have. In addition, your body weight is likely much lower than it was before your surgery, meaning you get a higher dose of alcohol per pound. Several studies compared blood alcohol concentrations in women who’d undergone gastric bypass with those who hadn’t had the surgery. The studies showed that, for women who’d had the operation, blood alcohol concentrations peaked sooner and at approximately double the level of those who hadn’t had the operation. Women who’d had the procedure also felt much more inebriated for longer.